Before Christmas I took a blood test. It revealed that I had high cholesterol and not the good kind. My doctor asked me to go see a registered dietitian nutritionist for a consultation on my diet. To say that I was embarrassed, given that I write this blog is an understatement. I was mortified!! But, I know that I don’t know it all and I decided to go see her after Christmas. Notice how I did not go before the holidays. My LDL (Low-Density Lipoproteins) number is too high. When your LDL level is high, it can start to form a plaque-like substance on the walls of your cardiovascular system, blocking the natural flow of blood and leaving you at severe risk for heart attack and stroke. My family has a history of heart disease so I knew it was important to take this number seriously. I was not looking forward to the visit (kinda like going to the dentist) but I knew I had to listen to what she had to say. My doctor threatened to put me on a statin (drug) if I couldn’t control my LDL with diet and I don’t want to take a drug if I can help it. The RDN was very kind and asked me what I ate the day before. That day had included a visit to an Indian buffet where I ate a ton of rich food. You see, I do eat a healthy diet and I exercise (currently training for a triathlon) but I also enjoy gourmet food and eating out. My diet includes butter, whole milk, gourmet cheeses, artisan bread, pizza and beer as well as kale salads, beans, and roasted vegetables. I eat dessert every once in a while and put butter on my popcorn. I am far from a saint when it comes to my diet. I don't eat junk food but I do eat foods that are rich in saturated fat. oh dear. What does she want me to do? For THREE weeks, I have quite a challenge. At least she didn't limit my coffee intake. She can take my coffee from my cold, dead hands. But it does mean no pizza (white bread and cheese) or beer – and no pizza and beer! Beer is high in carbohydrates which convert into sugar – and is bad for cholesterol levels. Argh!! The first thing I did when I came home was announce that I was taking the beer out of the fridge. I asked my partner how many he wanted to keep in the fridge as I started to pull out the cans. He said, “Oh, if you aren’t going to drink it, neither will I.” Wasn’t that sweet? Then I reviewed my bread options. I usually eat one slice of Dave’s Killer Bread in the morning with either butter, peanut butter, or avocado. Guess what? Dave’s bread has added sugar!! Nooooooooooo. I had not noticed “organic molasses” on the fine print of the ingredients list. Dave’s bread is whole wheat, organic, and full of seeds but it has added sugar. Bummer. I have decided to share my challenge with all of you because I know that there are others who are struggling with the same thing. The funny thing is that this diet looks a lot like the one Weight Watchers is promoting with Freestyle. I don’t NEED to lose weight but that 10 pounds that hangs on would be nice to take off. The RDN credited my high cholesterol to menopause (wasn’t that nice?) and said as we get older we need to do a better job with our diet. Since I have high cholesterol, I want to do a better job with my diet. Wish me luck! I want to be here for my kids and grandkids so I am going to give it a shot for three weeks. After the three weeks, we'll assess how I did and talk further. The good news regarding pizza (and a lot of other things) is that you can still have a really good pizza on an oil free, whole grain crust with sauce, plenty of vegetables and one of the fat free vegan cheeses (Check out Kite Hill). The Engine 2 line also has some great suggestions for bread-type products. I know it's not the same thing as the pizza that we grew up on but I've come to like it better. You can do It! Super proud of your honesty. You help so many people with all that you share on this site. Much Love Girl! You got this!!! hmmmmm, I'm on my way to the doctor this morning and I fear the results of the blood work I had done yesterday. I retired a year ago and being stuck at home with no car you can imagine what I do a lot. eat, very little exercise (especially with the cold) and sit around on my computer and watching tv. i'm sure I will be here tomorrow looking for help, LOL. Best of luck to you. I also have high cholesterol and have been on medication for years. Mine is genetic as my good cholesterol is high and my bad is low but I still have to watch. I need to lose weight and am on the new WW plan and love it. Good luck to you and your challenge and I am hoping my numbers come down also. As I approach 49 this year I want to be in the best shape that I have ever been. I usually go for my physical mid year and my weight over the past 5 years has increased 20 lbs which thankfully hasn’t effected my blood work or activity yet. I stumbled upon dietdoctor.com and was SHOCKED at what I had learned. I’m an RN and I’m married to a MD...we decided to change our way of eating. They have an amazing amount of research and interviews on there that explains the LCHF diet and why it works and LF does not. I was gobsmacked as I have done everything to avoid fat most of my life. I’m so happy I stumbled upon the website! They have many many good documentaries available which show amazing data...Cereal Killers 1 and 2, Statin Nation 1 and 2...check it out, you will be shocked too. 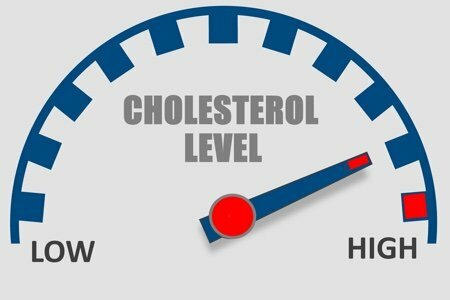 Isn't high good cholesterol and low bad cholesterol what we are working for? Statins give me nightmares and constipate me. I'm on red rice yeast but I won't know how that is working until my next lab test in February. Diet alone doesn't work for me. Good luck! You can do it! I have been on a similar diet for 3 years and my reading has dropped significantly! My doctor also encouraged me to eat more fish, lean meat and incorporate vegetarian dishes into my diet regularly- eating less meat is what has really helped me, I believe. There are so many good vegetarian options to explore! An adventure! I appreciate your honest sharing. My husband and I are on a similar challenge. We don’t eat sugar or flower and we eat lots of fruit and vegetables, mostly raw. Breakfast is often a lightly cooked apple, sliced and chunked with the skin on and cooked in 3/4 cup of water with a generous amount of cinnamon. Then we add 1/3 up of old fashion oatmeal and heat it for 30 seconds. It’s delicious and any leftover is great for a snack later in the day. Good luck Lisa! I have the same struggles. I eat healthy most of the time, incorporate lots of veggies but use half and half in my coffee and eat a (small, homemade) dessert daily. I am always looking for more vegetarian options for satisfying meals. My cholesterol does drop when I can go strictly vegetarian but it does take extra effort to learn new tricks. You can do this 3 week challenge - you are an inspiration to us all. I, too, appreciate your honesty. After just having had my physical on January 5th, I received similar news. Thank you for letting us know what your RDN said. This is helpful for many of us. I have been thinking of re-joining WW for similar reasons. Your hubby sounds like mine - very supportive. We are blessed indeed. Please know I will be in solidarity with you in this endeavor. We've got this!! Sounds like WW Freestyle would be good for ya. Also, here's a couple links that night interest you https://www.betternpeanutbutter.com All the best! Wow what great comments. I liked reading this article so much I printed a copy as a reminder others struggle with cholesterol. I am in the cardiology field and witness patients getting stents placed in their arteries from plaque build-up. Keep the comments coming, I plan to follow for encouragement. Snack Girl keep us up to date on your progress and what your eating. You rock & your real! I’m currently doing the same thing. My breakfast today is oatmeal with almond butter, ground flaxseed, cinnamon, and skim milk. It took. Few days to get used to not putting anything sweet on it, like brown sugar or maple syrup, but now I don’t miss it. I'm sorry to hear your LDL number is high but glad you'll be sharing your experience in lowering it through diet. Your work is very influential and motivational to so many. Our local WF sells ww pizza dough. If it is mixed with white, you and your food processor can make very yummy all-ww pizza dough. A new opportunity. No beer is one thing. No pizza quite another!!! And, it turns out, you can throw baby arugula on top of almost any pizza and it wilts and adds to the nutrition AND the flavor. And, a little part-skim mozzarella on top of whatever veggies you choose will make it taste like pizza. It doesn’t take much!!! Good luck!!!! Bummer regarding Dave's killer bread. I've been eating the 'good seed' for over a year. Will continue eating it, just cutting back the frequency. Best to your health Lisa, stay away from the statins !! all those negative nellies wrong! i’ve done it myself and i was so lucky that i had the lifestyle change option before anything else. it was the right choice for me. good luck lisa! When I was in my early 20s, I went in a drug to help my bad acne. This raised my cholesterol above 200 (plus I have high cholesterol in my family history). I've been taking fish oil pills everyday ever since, and my numbers have come down (like 180, which isn't typical for someone my age but my doc isn't concerned) and I get them checked every year (sometimes twice a year). maybe I shouldn't totally forget about those high numbers, though, because in 10-15 years I might not be able to change them as easily. I quit WW b/c I was tired of tracking and not being able to eat whatever... but I should probably go back.